38 Trails. 2 Summits. 1100′ vertical…and a little something for everyone. Caution : Snowcats, snowmobiles and snowmaking may be encountered at anytime and at any location in the resort. Lift Safety: Be advised that you cannot board a lift unless you have sufficient physical dexterity, ability and knowledge to negotiate or to use such lift safely or until you have asked for and received information sufficient to enable you to load, ride and unload the lift safely. You may not use a lift or any ski trail when under the influence of drugs and/or alcohol. Woods Skiing and Riding The woods are available to expert skiers and riders. They are not open, closed, marked or patrolled. Woods are littered with rocks, stumps, fallen trees and other objects that can damage you and your equipment. It is recommended you ski or ride in groups of no less then 3. Ski and Ride with Common Sense: Skiing and riding are exciting, challenging participant sports that often present dangers and inherent risks, including but not limited to trees, uneven terrain, changing conditions, bare and/or icy spots, natural and man made objects, snowmaking equipment that may or may not be operating, and other skiers, snowboarders or people using the slopes. Some slopes and wooded areas are not groomed or equipped with snowmaking. While skiing USE CAUTION and abide by the Responsibility Code and NYS Article 18, posted around Plattekill Mountain. 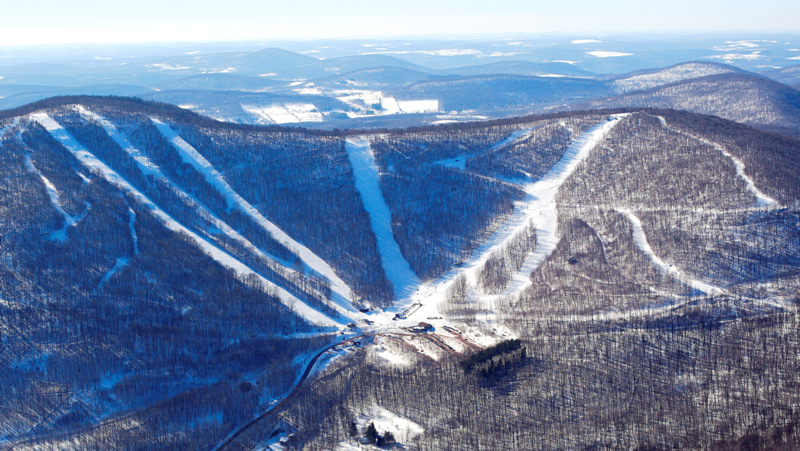 If you cannot accept these risks of skiing and riding, we ask that you not ski or ride at Plattekill Mountain. Remember, safe skiing and riding is everyone’s responsibility. It is also the law. Be Advised that all poles and/or flags, fencing, signage and padding on equipment or objects or other forms of marking devices are used by the ski area to inform you of the presence or location of a potential obstacle or hazard. These markers are no guarantee of your safety and will not protect you from injury. It is part of your responsibility under Your Responsibility Code to avoid all obstacles or hazards, including those that are so marked. Know the code. It’s your responsibility. This is a partial list, please be safety conscious. 1. Always stay in control and be able to stop or avoid other people or objects. 3. Don’t stop where you obstruct a trail or are not visible from above. 5. Observe all posted signs and warnings. Keep off closed trails and out of closed areas. 6. Always use devices to prevent runaway equipment. 1. Make a Plan. Your speed, approach and take off will directly affect your maneuver and landing. 2. Look Before You Leap. Scope around the jumps first, not over them. 3. Easy Style It. Start small and work your way up. 4. Respect Gets Respect. From the lift line through the park. 5. Inverted Aerials are Prohibited.